Religious leaders and leaders of international organizations spoke to the Assembly about what it means to “Welcome the Other.” Speakers at the Opening Session included H.E Nassir Abdulaziz Al-Nasser, UN High Representative of the Alliance of Civilizations, delivering his own remarks as well as a message from United Nations Secretary General Ban Ki-Moon; Father Father Miguel Ayuso, delivering a message on behalf of His Holiness Pope Francis; H.E. 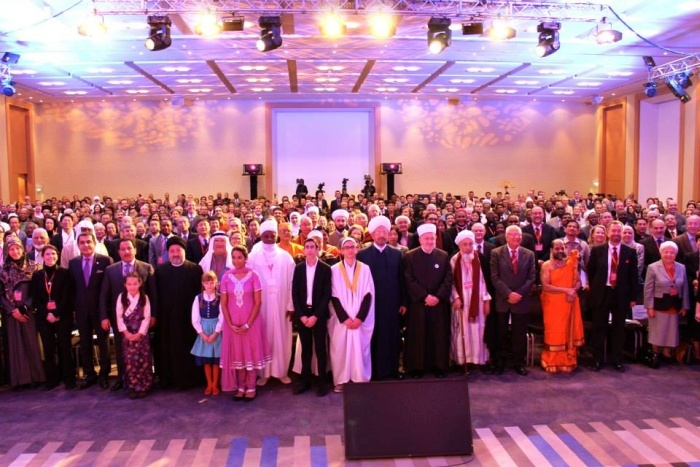 Faisal bin Abdulrahman bin Muaammar, Secretary General of the KAICIID Dialogue; Honorable Ela Gandhi, Honorary President of RfP; and Dr. William F. Vendley, Secretary General of Religions for Peace. The Opening Session set the tone for the Assembly that will follow, which will focus on “welcoming the other” through advancing human dignity, shared wellbeing, and a more robust notion of citizenship. The first plenary of the Assembly today focused on the larger Assembly Theme “Welcoming the Other.” The plenary’s panel featured Sheikh Abdullah bin Bayyah, President of the Global Center for Renewal and Guidance in Mauritania/Saudi Arabia; Rev. Nichiko Niwano, President of Rissho Kosei-kai and Co-President of RfP; Chief Rabbi David Rosen, International Director of Interreligious Affairs of the American Jewish Committee and Co-President of RfP; Emmaus Maria Voce, President of Focolare Movement and Co- President of RfP; and Dr. Alaa Naseif, Chief of Staff of the KAICIID Dialogue Center. RfP Secretary General Dr. William Vendley delivered inspirational opening remarks during the Opening Session today. To read his opening address, click here. To watch the video of his opening address, click here. 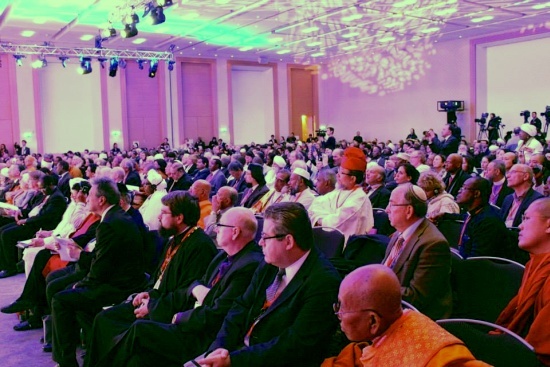 The 9th World Assembly, in addition to discussing “welcoming the other” in relation to conflict, serves in itself as a venue to transform conflict. 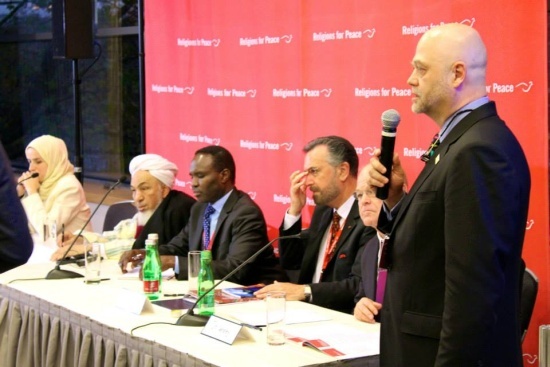 This Assembly is an opportunity for diverse religious leaders from zones of conflict to engage with each other in a safe space. 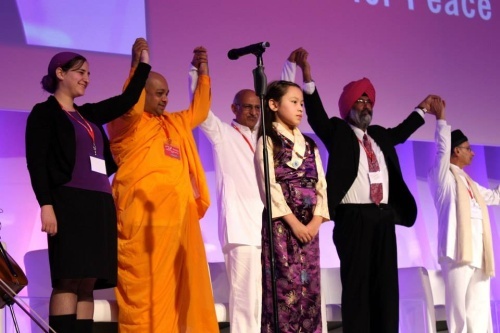 This demonstrates the power of multi-religious collaboration to transform conflict. 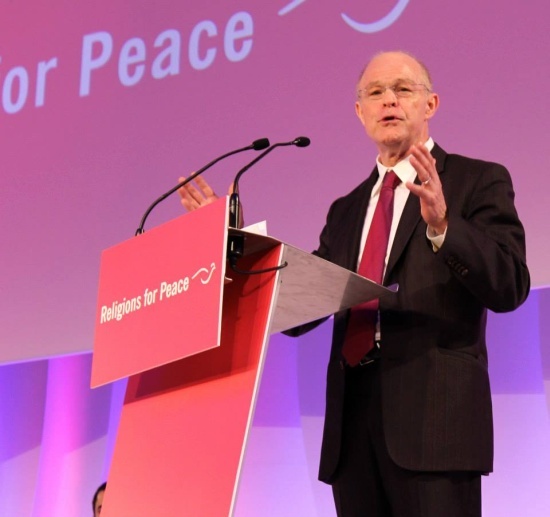 According to Dr. Vendley, “We are thrilled that our friends from North Korea and South Korea are at the Religions for Peace Assembly meeting to speak about shared values.” Dr. Vendley also noted that several religious leaders from Syria are in attendance at the Assembly. The first meeting of the Assembly Commissions occurred today, bringing together leaders to work on tangible, concrete actions to welcome the other. The four commission themes are conflict prevention and transformation; just and harmonious societies; human development that respects the earth; and religious and interreligious education. The Assembly Commissions will continue to meet throughout the Assembly, and by the end will present a report that will be shared widely with multiple stakeholders, including religious communities, governments, intergovernmental organizations, civil society and the private sector.